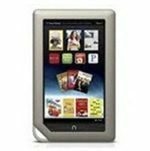 Barnes & Noble launched a new version of their B&N Nook Tablet today. Barnes & Noble held this one pretty close to the vest, with news of the new tablet only leaking out yesterday. The new tablet will cost $199, matching the price of what is considered to be its main competitor, Amazon’s Kindle fire. B&N’s original Nook Tablet has 16 GB of storage and sells for $249. The new version will have 8 GB of storage. In addition having half the storage space of the original, it will also have half the RAM, 512 MB. The Kindle Fire also has 8 GB of storage and 512 MB of RAM. Of the 8 GB of storage in each tablet, 6 GB is actually usable in the Kindle Fire, and 4 GB in the new Nook Tablet. The rest is reserved for the operating system and other features within the tablets. However, the Nook Tablet has a microSD card slot that can handle up to 32 GB of expanded storage. The Kindle Fire does not. Power wise, the new Nook keeps the dual-core processing power of the original, which matches the same cpu power of the Kindle Fire. The new Nook also keeps its microphone, which the Kindle fire doesn’t have. Along with launching the Nook Tablet 8 GB version, Barnes & Noble also announced today they were dropping the price of the Nook Color. It’s now $30 less, $169.